You are here: Home » Raheem Sterling – What Does The Future Hold? Since John Barnes England have not had a left midfielder that we can trust to take the opposition defender on and deliver a killer ball or finish it themselves. Our left midfield has become such a weak position in the national team that we have now resorted to playing Danny Welbeck there. However, in Raheem Sterling we might finally have got ourselves a replacement, I don’t want to be putting any pressure on the youngster but if over the next two seasons he improves on the early season form he showed this year than he will cement he’s place at left midfield in the national team for a long time. The Jamaican born winger started he’s career at QPR where he joined their youth team at the age of ten. After a seven year stay in London he was signed by Liverpool for £600,00 (rising to £5 million on appearances). Sterling than spent two years playing in the youth academy team at Liverpool as well as featuring for England at youth levels. After becoming a key figure for both teams the call was coming from fans to see him get a chance with the Liverpool senior team, and so he began to get taken on European trips as part of the squad but without getting game time. In 2012 Sterling began to stake more of a claim for a debut and this was granted in March as he came on as a substitute against Wigan where he became the second youngest player to play for Liverpool. In the summer of 2012 Brendan Rodgers was appointed as Liverpool manager and it is under he’s management that Sterling has begun to flourish and for a while was one of the first names on the team sheet every week. 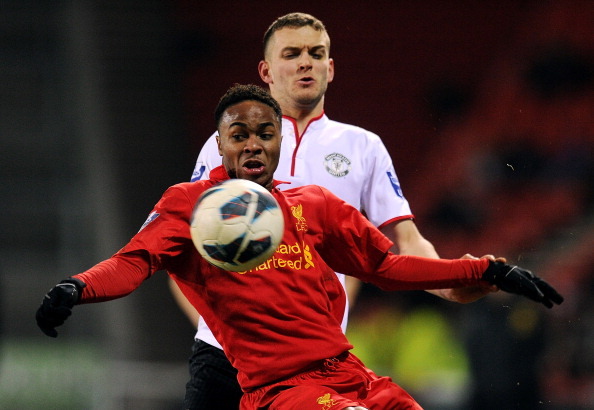 We are now coming towards the end of Raheem’s first season in the Liverpool team and he has been very impressive. The winger has made 23 appearances so far this year and has created 37 chances for he’s team mates in the process. However, he has only picked up 2 assists in the process. The youngster was beginning to burn out and so Rodgers took the decision to rest the youngster, as a result he hasn’t played since 11th February where he featured for 30 minutes in a 2-0 loss to WBA. Below is a heat map for Sterling in that game. As it shows Raheem likes to play in the wide positions and it is this that makes me think that he will go on to be successful in the England national team and in the Premier League. From watching Raheem this year you can see the amount of potential he has and the ‘take on all comers’ approach to every game that he goes into. Not once this season have I seen him be frightened to run at any wing back that he is faced by. He has quick feet and great balance and when running at full speed can change direction in the blink of an eye which makes it very difficult for defenders to mark and track him. When asking twitter on their thoughts on what Sterling is like as a player Liam Lee (@Liam10Lee) said: “Pace and dribbling is good and so is his determination. Far too lightweight but that should improve with experience” This shows that Liverpool fans clearly think a lot of what Raheem has to offer but still has a lot of improvement to make in other areas if he is to become a world class wide man. So where can we expect to see Raheem in the next five years? In my own opinion I feel that he will still be at Liverpool and will be there for a long time unless something happens at the club and they are in a position where they need to sell some of their best players. But for Sterling to continue to develop at the rate that he has shown this season than staying at Liverpool with Brendan Rodgers would be the correct career move for him. Now if he was to move on in the next five years do not expect him to be picked up by an English club, if he was to move on than it would most likely be a move to Spain but for now he just needs to knuckle down and stay at Anfield.